Changing your dishwasher filter every three to six months can drastically improve your results. Many homeowners don’t realize the importance of this routine maintenance task, but it is essential in order to keep your appliance running smoothly. 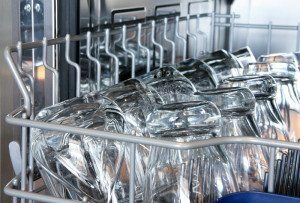 Your dishwasher will not perform the way it should, and dishes will not get clean if the filter is clogged with food particles. Some filter types can be manually cleaned several times before replacement, but regardless of your model, you will need to change the filter periodically. First, locate your filter. Usually it is under the drain cap at the bottom of the inside basin, but it may be off to the side. Next, you’ll need to determine what type of replacement to purchase. Some models use extra-fine screens, while others have a triple-layer helix filter. Every dishwasher uses a particular type of filter, and some are brand-specific. You can find information for your model by looking at your current filter or in your product manual. Depending upon your model of dishwasher, you may need to order your part online rather than purchasing it from a local appliance store. Once you have your new filter in hand, it’s time to remove the old one. Start by unplugging the unit or turning off the power to its breaker. This will ensure that the machine doesn’t accidentally turn on while you are working on it. Next, remove the cover. With some dishwashers, the cover will simply pop off. On other models, however, the cover is held in place by screws. After you get the cover off, remove the filter. Reach in and grab the handle of the cup assembly at the base, pull it straight up and lift the filter right out of the cup. Before you set the new filter in place, it is a good idea to clean out the area around the cup and basin. Food particles may be lodged there, so take a sponge or rag and gently wipe it out. Then place the new screen into the cup assembly, being careful to make sure that the water tube remains tightly connected to the cup. Put the cup back into the basin and secure the cover over the housing. You can then turn the power back on and run a full cycle of dishes to test the new and improved performance of your dishwasher! Changing your dishwasher filter is usually doable if you’re handy, but not everyone is so inclined. If this process sounds daunting or if you don’t want to risk damaging your appliance, contact the experts at Complete Appliance Repair today. 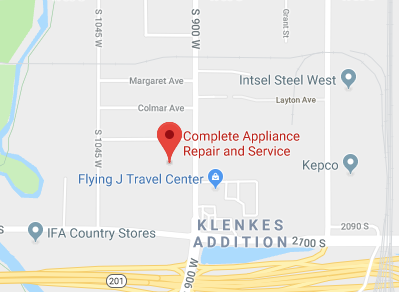 Serving North Salt Lake, Utah, and the surrounding communities, we are always available to help you with this and any other appliance maintenance tasks. Call today to schedule your maintenance service and dishwasher filter change. This entry was posted in Blog and tagged Dishwasher maintenance, Home maintenance on October 6, 2015 by admin. Do you know about the benefits of duct cleaning? Although you probably don’t often think about your air ducts, cleaning them can make a surprising difference in your quality of life. Many consumers believe that air duct cleaning is an unnecessary service, but some strange things may well be lurking in your home’s ductwork. Experts estimate that the average American home has never had its ducts cleaned, and fewer than 15 percent of U.S. homeowners report having their ducts cleaned regularly. If you’re one of the many who don’t, consider this: The health benefits you and your family will experience are likely to far outweigh the expense. The Air Duct Cleaners Association estimates that the average home accumulates 40 pounds of dirt, debris, and allergens each year in its air ducts. Fungus, mold, dust mites, and pollens thrive in this buildup and seriously degrade the quality of indoor air. As a result, you and your family can experience allergies, eye irritation and breathing problems. For those people who already have asthma or other respiratory problems, poor indoor air quality can cause these conditions to worsen significantly. It is important to have your home’s air ducts cleaned regularly if you have pets, live in a humid or dusty area or if construction has been done in your area recently. Unless your home is new, it is difficult to know how well the previous owners maintained it. Unsavories that can accumulate in ductwork include bugs, rodent feces, mold, mildew and other environmental pollutants. Air flow can become restricted, reducing the efficiency of your HVAC system. 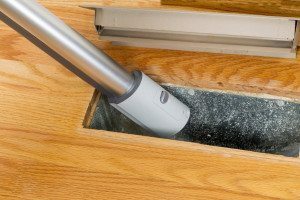 If your family is experiencing allergies or breathing problems, or if you find yourself having to dust frequently, you likely need your ducts cleaned. Take off a vent cover (register) and look inside for dust buildup or debris. Reach in and swipe your finger or a light-colored cloth across the duct surface. The results will speak for themselves. The best air duct cleaning service companies are those that offer and perform the service on a regular basis. Hiring a handyman or trying to do this work yourself is likely to stir up more problems than it resolves, potentially damaging your system or causing duct leaks. This is a fragile process requiring specialized training and equipment. Find a licensed, local company that offers this service. The cost of residential air vent cleaning will vary depending on many factors, but be wary of those companies that use harsh chemicals. Calling on a reputable, locally owned company will give you peace of mind and clear air for you and your family. Complete Appliance Repair offers comprehensive duct cleaning and maintenance service throughout the Salt Lake City area. Air conditioning season is right around the corner. Contact the friendly, professional staff at Complete Appliance today and schedule your duct cleaning. This entry was posted in Blog and tagged Air Duct Cleaning, Home maintenance on April 16, 2015 by admin. Your range hood is one of your kitchen’s true multitaskers. Removing smoke, odors, grease and even excess heat from your kitchen, the range hood not only keeps your kitchen cleaner and smelling better, it also keeps you from being overcome by fumes. As a bonus, it sheds light on your cooking surface and it may even house that invaluable microwave. If you’re in the market for a new vent hood for your home, read on for some basic information about the different types and features available today. Whatever your kitchen configuration and needs, there’s a hood for that. 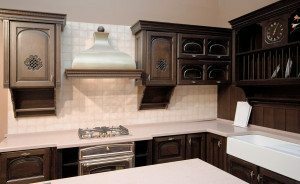 You can select a hood that attaches to the bottom of a cabinet (undercabinet style) or one that attaches to the wall above the stove (chimney style). If your cooktop or range is located in an island, you can purchase an island-style model that attaches to the ceiling. Downdraft hoods, for use with cooktops only, pop up from a concealed location when needed. Finally, low-profile ventilator hoods known as power packs or inserts are designed to integrate unobtrusively into over-range cabinetry, using a flush installation. The way your range hood is vented determines, to a great extent, its effectiveness. The most effective models are those that are ducted to the outside. If the duct run is long due to the hood’s location, choose a more powerful model than would otherwise be necessary. If you are simply unable to run duct, non-vented models are available. Whereas vented models use aluminum filters, ductless range hoods use charcoal filters to clean the air, then recirculate it back into the room. Along with the recirculated air comes at least some of the odors and heat that a ducted model would transfer outside. Some models, called convertible range hoods, can be used either with ducting or without. Today’s hoods offer several lighting options, including standard (incandescent) lighting, LED, compact fluorescent and halogen. Many have an added safety feature that senses heat, switching on the filter fan if the temperature exceeds a certain level, then turning it off again once the temperature drops. The most popular range hood option in the United States is the microwave type, but now you can also choose a convection oven/hood combo as well. Experts agree that combo hoods are not as effective at filtration, but the convenience factor makes this style a good trade-off for many people. Complete Appliance Repair, serving Salt Lake and the surrounding communities, can install a new hood for you, as well as provide parts, maintenance and repair services. For all your home appliance, heating and air conditioning needs, Complete Appliance Repair is your locally owned and operated expert. When you’re ready to purchase a new range hood, let their experienced professionals help you make the right selection. This entry was posted in Blog and tagged Home maintenance, New Appliances, Range Hoods on March 11, 2015 by admin. 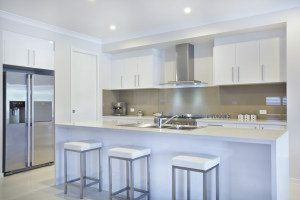 This year’s hottest kitchen appliance trends were unveiled earlier this year at the 2015 Consumer Electronic Show (CES) in Las Vegas, and although stainless steel has been the favorite of both consumers and kitchen designers for the better part of two decades, some appliance manufacturers believe they have potential successors. Read on for an overview of what you are likely to see more of in the coming year. Appliance manufacturer Whirlpool introduced its Sunset Bronze line at CES this year, and it’s a major departure from anything else currently in production. Sunset Bronze is a brushed metal finish with a warm champagne gold-colored coating. Whirlpool’s product specialists say that this finish reflects the colors around it. The biggest benefit is that this product line was designed to resist fingerprints. Essentially only three color families are available today (white, black, stainless), and Whirlpool hopes to make it four with Sunset Bronze. Electronics giant LG introduced an ultra-shiny, black, glass-front refrigerator known as the Contour Glass line. A slightly nubby, black-patterned finish is covered with a single sheet of tempered glass, providing both a deep, rich finish and an easy way to clean fingerprints and other smudges. Reviewers have praised this new, modern design as an instant classic, but it’s actually been popular in both Europe and Asia for several years. Many of the home renovation television shows have even started using the Contour Glass products, guaranteeing a broad level of exposure. LG’s Contour Glass product resembles a line launched by Whirlpool in 2012, with finishes called White Ice and Black Ice. Both colors feature bright silver trim and finishes. GE’s Slate line is a great alternative if you like the look of stainless. Inspired by the color and texture of stone, Slate is a warm and inviting matte finish that hides fingerprints and dirt. Finally, expect to see a lot of color in the future of kitchen appliances. Everyone from GE to Viking is offering bold, brightly colored appliances. Complete Appliance Repair, serving Salt Lake City and the surrounding communities, knows you like to stay on the leading edge of appliance trends, even if your budget doesn’t. If you fancy adding one of these new trends to your kitchen, let Complete Appliance assist you. If you prefer to wait a few years to see which trends really catch on, they understand that too and are committed to keeping your current kitchen appliances running and looking good. This entry was posted in Blog and tagged Home maintenance, Kitchen Appliance Trends, New Appliances on February 4, 2015 by admin.